Big Belt Mountains (Helena National Forest) on a bluebird day as seen from the Montana state capitol building in Helena. The bus heaves out of Missoula Valley under a thick inversion fog. It is January 11th, 2019, in the shadow of the longest-ever government shutdown; the heavy sky overhead really fits the bill. Nearby ridges and peaks of the Lolo National Forest sit obscured, but I know they are there. They are the landforms by which I’ve conditioned my life in this place. Without those physical waypoints to tell me where I am and how I’m moving I feel a touch disoriented, and my home makes much less sense. This is a metaphor. Some things about life in America just seem sturdy, like those mountains I navigate my world by; National Forests have existed since before my grandparents were born. Picture a satellite map of the West, and among that pervasive burnt umber tone are great swaths of literal forest green, the respite of clouds and messengers of water and air, havens of renewal and retreat. Some people even live there, making their lives in the secret folds of those hills. Spend 20 minutes with a geology textbook and with a little imagination you realize that mountains are not permanent. Neither are public lands held in trust by everyone equally. That’s another sobering realization. There are forces at work even within such a land-centric state as Montana willing to tear down what we have known for a century or more based on some skewed version of frontier mythos, of a libertarian Eden that never was. For as long as many of us have been acclimating to modern cities, another contingent of Americans have known the countryside and its preserved reservoirs of health and sanity and livelihood. The truth is, though, that we all know it. Wallace Stegner called this the “geography of hope”; “even if we never do more than drive to its edge and look in,” the fact that the land is there, always, at the rough edge of town or homestead, that it breathes and moves on its own terms, gives all of us a birthright sense of refuge, some intuitive comfort to recline against. 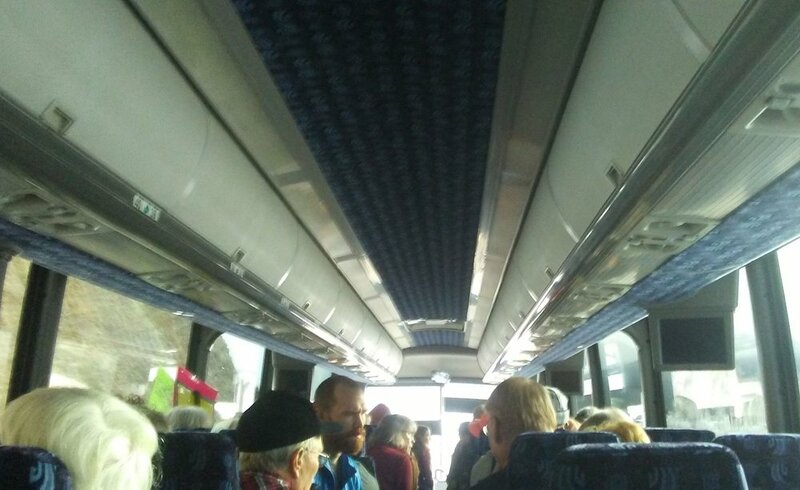 I’m on a bus with 20 strangers, most about twice my age, en route to Helena to make our case at the state capitol building for retaining the “public” in “public lands,” for refuge and livelihood in perpetuity. The bus cruises along I-90 while I stare out the window and dream about this rich landscape (it’s a roadside landscape still worthy of dreaming, a rare and precious thing in modern-day America). The rivers run, the mountains rise, and in the secret folds of the hills I know that deer and elk, fox and mink and buried insects are making their lives in quiet profusion. These lands breathe, they move, they pulse in ways that humans can only guess at; it’s all a storehouse of mystery. If history is any guide, it would seem it takes a heap of foresight and altruism for humans to look the unknown dead in the face and let it be, but I’m willing to do just that. I think everyone with me on this bus is willing, and we’re also willing to gather en masse to make it known that we value mystery in a world that’s had most of the mystery whipped out of it. Helena, Montana feels a long way off from Washington, D.C. most days. It’s far, but at times like this when the federal government has failed, we realize we’re in an ecosystem: small swells cast a wide and resounding current, we feel the far-off footstep, deal with the reverb from every decision however minor or major. Our bodies and voices, it turns out, are necessary and dire things. It doesn’t often feel that way. To raise a voice or wave a flag in Montana can seem as weak and fleeting as a pebble dropped in the ocean; the ripples rise, echo, and fade, and nothing much changes. But, again, this is an ecosystem. There are no insignificant corners. We never know what chains of cause-and-effect might be rattled by our presence. In that case, it’s worth it just to show up. And show up, we did. For one blissful hour you could almost forget about the chilling effect of a government shutdown or the threat of public lands divestment. The people showed up (1,800 attendees by one estimate), and the noise we made was true. Affirming. Among those who spoke to the assembled — including Senator Jon Tester, outfitter and guide Maggie Carr, and Governor Steve Bullock — the word “heritage” held a place of distinction, showing up in every speech and drawing ample cheers from the crowd. Heritage, a word which shares a root with heir, heirloom, and inheritance, words often relegated to stations of wealth. Maybe when that word was spoken we all recognized public land as our shared inheritance, and no matter what our bank account says when we kick off into the wild blue, that inheritance will be passed along down the generations. That’s a powerful feeling. Shane Doyle, college professor and member of the Crow Nation, summed up his speech at the capitol by calling up our state’s many mountain ranges and their ability to make us feel at home wherever we happen to be: “as we travel around Montana, each and every one of us knows exactly where we’re at” by looking at and naming the mountains. And so, the fight for public lands goes much deeper than recreation and scenery, and just as deep as drinkable water and clean air: ridges, rivers, canyons, peaks, and prairies make up the lines by which we frame our lives, how we measure our paces and gauge the mood or movement of our days. We give space a name; it then becomes a place, a vessel for the stories we tell. There’s something especially reassuring about public lands, places that belong to all of us: the stories held there are shared by everyone and become the cultural fabric of a given spot on the map. Take Missoula, Montana. Lolo, Stuart, Sentinel, Pattee, Rock Creek, Ch-Paa-Qn, Bitterroot, Jumbo, Blue Mountain, Clark Fork, Rattlesnake, Council Grove, Maclay Flat: these words ring the Missoulian ear like tones in a major scale. Familiar and full of soul associations. These places carry the significance of myth or legend, but they are very real, so real we can see them, walk right up and touch them, put our stories into them, include them in our stories, and share in those collected stories with complete strangers with whom we may have little else in common. The land holds us, and in turn it binds us together. And we hold these places in common, places open to any who make the journey.